© Makhija et al. ; Licensee Bentham Open. 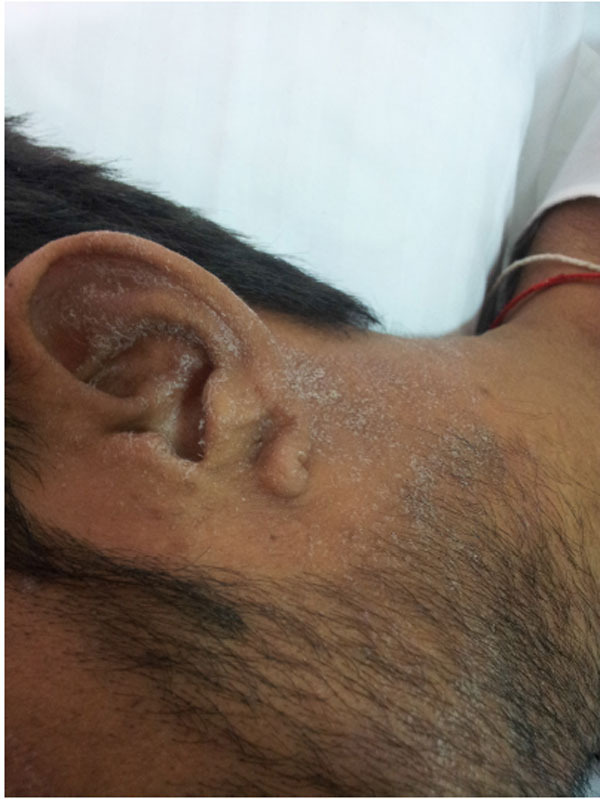 A 26-year-old man with chronic kidney disease secondary to chronic tubulointerstitial disease was admitted with generalized weakness, vomiting and itching all over the body for 10 days and with documented non-adherence to medical management. Physical examination revealed a pulse rate of 98/minute, blood pressure of 140/80 mm Hg, bilateral lung crackles, and pitting edema of the lower extremities. The skin over both shins and left side of the face had scattered deposits of white, friable, crystalline material, with a “frosted” appearance [1, 2]. These deposits were confluent in some areas and discrete in other (Figs 1, 2). Pertinent laboratory data were as follows: hemoglobin, 6.7 g/dl; serum sodium 130 mEq/l; bicarbonate, 10 mEq/l; blood urea nitrogen 182 mg/dl; and serum creatinine 35.74 mg/dl. Hemodialysis was initiated. The crystalline, white material on his shins was uremic frost seen in extreme azotemia, which disappeared after 3 sessions of hemodialysis. Laboratory data after initiation of hemodialysis showed serum sodium 138 mEq/l; bicarbonate 27.6mEq/l; and serum creatinine 10.57 mg/dl. Hirschsprung first described uremic frost in 1865. 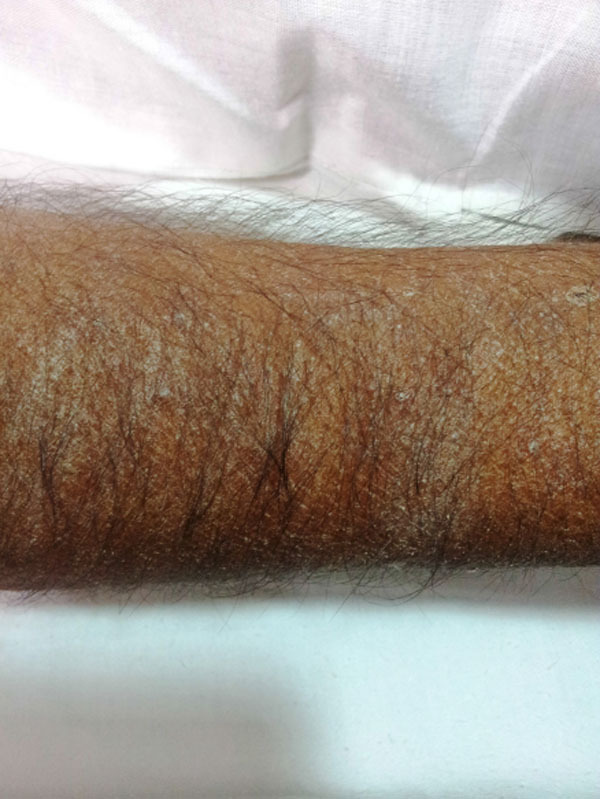 This dermatological manifestation of severe azotemia is rarely seen today because of timely implementation of renal replacement therapy. The concentration of urea in the sweat increases greatly when blood urea nitrogen level is high. Evaporation of sweat with high urea concentration causes urea to crystallize and deposit onto the skin. To verify that the crystals are composed of urea or nitrogenous waste, scrapings of the frost can be diluted in normal saline, which can then be tested for elevated urea nitrogen levels comparable to blood levels. Udayakumar P, Balasubramanian S, Ramalingam KS, Lakshmi C, Srinivas CR, Mathew AC. Cutaneous manifestations in patients with chronic renal failure on hemodialysis. Indian J Dermatol Venereol Leprol 2006; 72: 119-25. Bencini PL, Montagnino G, Citterio A, Graziani G, Crosti C, Ponticelli C. Cutaneous abnormalities in uremic patients Nephron 1985; 40: 316-21.